Over 800 books on sale. Click on "products"
The following books are listed for sale by title and author on Amazon.com. Windows to Heaven – by Georget Kontos Photos. Biography of America's first female iconographer, Shirley S. Kontos (1949 - 1991). From a young age, Shirley seemed destined to follow the journey of a famous artist. Her studies earned her degrees from the Art Institute of Chicago, the University of Chicago, and Northwestern University. Her artistic talents brought her acclaim and recognition which led to an invitation to exhibit at the prestigious Whitney Museum in New York. She was well on her way to fame in the art world. However, a mysterious encounter with an angelic stranger changes the direction of her life. This heavenly messenger reveals the journey of a heavenly calling. He shares with dreams of her life that she had not expressed to anyone. She is to become famous, but not in the artistic field she believes. She is to embark upon a spiritual journey to overcome her shortcomings and faults, and to acquire knowledge and skill in an artistic field which transcends the earthly and opens “Windows To Heaven." Finally, she would arrive at the pinnacle of success. Before this successful moment, someone who had been very evil to her would capture her attention. If she ignored this person and turned her back in unforgiveness, all she had gained would be lost. The fascinating details of this spiritual journey are revealed in this previously untold story. A Franciscan Odyssey – by Father Lucjan Krolikowski. True story about a Franciscan priest arrested during WW II and sent to Siberia. After the war, he adopted 150 children whose parents died in Siberia, brought them to Canada, placed them in homes and helped in bringing them up and he later officiated at their weddings and baptized their children. Colours of Fire – This is a biography of a Polish nurse, Hanna Chrzanowska (1902-1973) by Dr. Gosia Brykczynska. Hanna has been beatified and on her way to full sainthood (the first lay nurse to achieve such an honor) in the Catholic Church. Hanna worked in Poland in community nursing but had to struggle to continue her excellent work under German occupation in WW II and then under the communists after WW II. Hanna is a fitting model for today's generation of nurses and healthcare workers. Handbook for Piano Practice – by Victoria B. Stearns. This book is an excellent companion and guide to piano practice, for both students, whether amateur or aspiring music major and a reference for teachers as well: the principles of good playing are the same for everyone. Piano Practice for the Advancing Student: Continuing the Journey Begun in "Handbook for Piano Practice" For Students and Teachers – by Victoria B. Stearns. This book continues the journey begun in "Handbook for Piano Practice," and like its predecessor, it is not a method, but a guide to accompany piano studies. Now the emphasis is the canon of piano literature: the master composers and their works. The elements and techniques of each stylistic period are explained so that the student can establish a solid background, which in turn will also enrich music appreciation in general. More practice hints are included for this advancing level, with efficiency of learning a priority, along with suggestions for expanding one's musical repertoire and knowledge in general. There is so much information that cannot be absorbed in the time constraints of lessons, so the student needs a reference book. Program Your Calculator – Dr. Gerald Rising and Dr. Deborah Moore-Russo, of the University at Buffalo and Dr. Eileen Schoaff of Buffalo State College wrote "Program Your Calculator," to give a basic introduction to programming with the TI-84 calculator through a series of interesting examples. Letters to a Young Math Teacher – by Dr. Gerald Rising. "An excellent book for beginning math teachers." – Greg A. Baugher, Mercer University, Georgia. Beginning Algebra – The text presents basic concepts in simplified personalized form often used in online PI (Programmed Instruction) Internet-based courses. 1 + 1 = 1 An Introduction to Boolean Algebra and Switching Circuits – This text was taken from an audio-visual Computer Math Series which was reviewed in The Mathematics Teacher and received praise, "the development is well done." Introduction to Gambling Theory – Know the odds –This text covers the fundamental concepts of probability and gambling theory in a simple and easy to understand format. 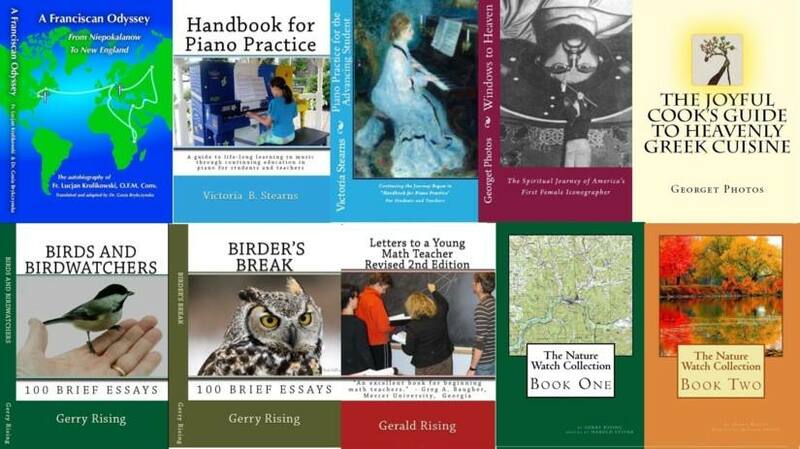 Birder's Break – A birdwatcher for 80 years, the author, Dr. Gerry Rising, brings that experience to informal essays which will appeal to all levels of bird and nature enthusiasts. Birds and Birdwatchers – This book contains many of the informal essays written by Dr. Gerry Rising during his 25-year tenure as a weekly Nature Watch Columnist for the Buffalo News. The Nature Watch Collection Book One – Professor Rising seeks to communicate to his readers his own involvement with and love of nature. He has explored the out-of-doors through hiking, canoeing and biking. At age 85, he rode his motor scooter on a camping trip around Lake Michigan, completing his similar "circumnavigations" of all the Great Lakes. Rising lives with his wife Doris in Amherst, New York, a Buffalo suburb. He has two children, four grandchildren and a great-granddaughter. Earth, God's Garden – By Donna Lewis. This book is an uplifting prayerful experience. It teaches young people and adults how to appreciate the beautiful manifestations of nature and life on earth utilizing excellent large colorful photographs with unique camera angles. The Calico Caterpillar – By Donna Lewis. A professional graphic arts designer stated that "The Calico Caterpillar" book is "Amazing!" He said, "The illustrations in this book are wonderfully beautiful and inventive! A thoroughly enjoyable visual feast for the eyes! I could go on picking out many details that make the images and their sequencing so terrific. The book is so well done that it is hard to find areas that could be improved." Animal Alphabet: Fun Facts – Illustrated fun facts about animals that will both educate and entertain children. 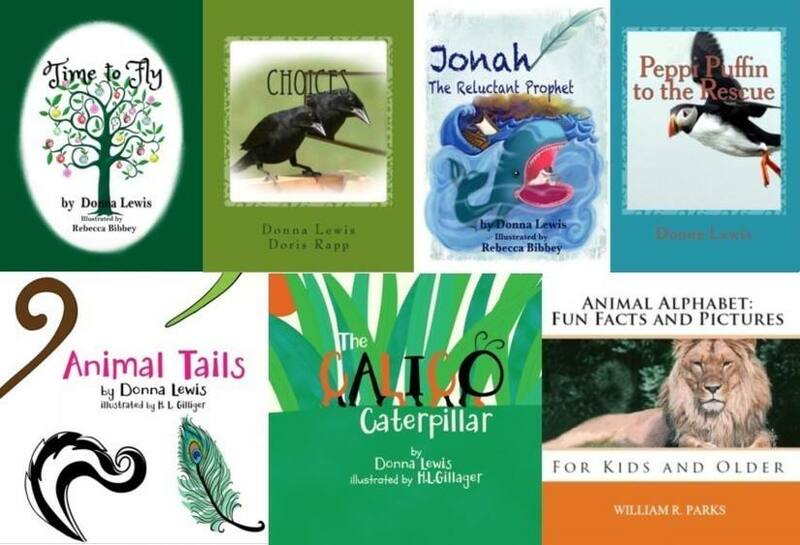 Animal Tails – by Donna Lewis. This is a lively illustrated rhyming book that will delight children with guessing games. A teacher said, "This 'tale of tails' will be added to her school library for young readers as well as for those who may have reading challenges. She said her English language learners will benefit from the vivid description and animal vocabulary." Choices – by Donna Lewis. Choices are make-believe beautifully illustrated story about birds choosing the colors of their feathers written and illustrated by Donna Lewis and Doris Rapp, authors of another children's book about birds, "Peppi Puffin to the Rescue." Time to Fly by Donna Lewis. Millie Wingler, M.A., Ed. Early Childhood Elementary Education stated, "This book will delight my preschool and kindergarten students. Jonah The Reluctant Prophet – By Donna Lewis. This is a colorfully illustrated Bible story about Jonah and the whale written for children. Peppi Puffin to the Rescue – By Donna Lewis. This illustrated book by Donna Lewis is for young readers. Peppi is a happy Atlantic puffin who comes to the rescue of an Atlantic whale who got tangled in a fisherman's net. We Remember the Day of President Kennedy's Assassination – by Barbara O'Shea. One of many testimonies by retired nurse's aide Marjorie Meyers: "It was Friday, November 22, 1963. I was living in Alden, New York and had no plans for that day. It was going to be a nice relaxing day. I seated myself comfortably in my front room in time to watch the motorcade of our president on television from Dallas, Texas." "All of a sudden, I saw our president, John F. Kennedy slumped over in the back seat of an open convertible car in which he was riding. He was seated next to his wife, Jackie who jumped up in panic. I was so confused and shocked by what I was watching. I couldn't help but cry as the news unfolded. I didn't want to believe our president had been assassinated. This kind of thing couldn’t happen to us." Made in America – by Professor Robert A. Wozniak. A resource guide for American made residential and non-residential products, materials and methods. As stated by Andes Lewendel, "If every builder bought just 5% more U.S. made materials, they would create 220,000 American jobs right now." Prayers from the Heart – By Sherry Tarlton. This is a tender, heartwarming devotional with inspiring scriptures and true stories. It is a living witness of what God can do if given a chance. You will find encouragement on each page to seek God above all else. The Joyful Cook's Guide To Heavenly Greek Cuisine –by Georget Kontos Photos. Book reviewer, Dr. Maria Secaras wrote, "I love the recipes in this book! Even though I work long days, I want to prepare delicious meals for my family and entertain friends. These recipes are quick and easy to make." The Field and Importance of Political Economy and The Payment of Labor – Political economist, Albert S. Bolles, writes clearly about economic principles because his views are not influenced by pecuniary interests. This book is Part One in our Classic Reprint Series in Economics and contains Chapters I and II of "Chapters in Political Economy" by Albert S. Bolles.